Alton’s Grace Nasello (left) possesses the ball against pressure from Belleville West’s Katelyn Grandcolas during the second half Thursday at Piasa Motor Fuels Field in Godfrey. GODFREY – Among the sports banners hanging from the wall in Alton High’s gym, girls soccer is among those still without a year earning a Southwestern Conference championship. And that irritates Gwen Sabo. Hopes for 2019 bringing that long-awaited SWC title to Alton took a hit Thursday under gray skies at Piasa Motor Fuels Field. Belleville West converted in four of five rounds of penalty kicks to pull out a 2-1 victory over the Redbirds after 100 minutes of play could not determine a winner. 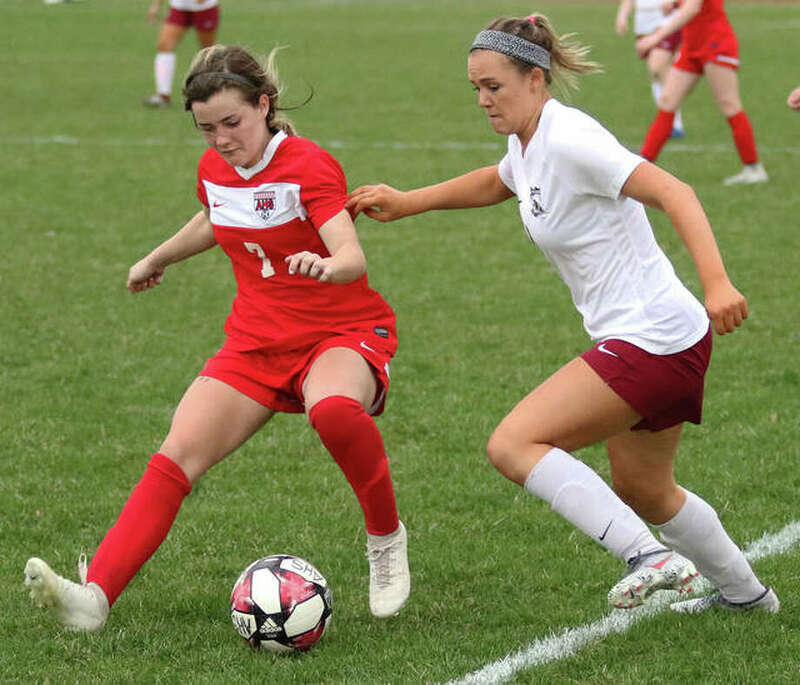 It was a disappointing outcome for Alton against an opponent that had not won a match since beating Marquette Catholic 5-0 in the Metro Cup on March 11. West halts a 13-match winless streak to improve to 2-11-2 and 1-6 in the SWC. But Alton is positioned to trim the deficit in half with a 2-0 halftime lead over Edwardsville in a game that was halted by rain last week at AHS. The second half of that match will be completed later this month. The Redbirds placed in a three-way tie for second in the SWC last season — their best finish — after posting a 3-3 record in league play in 2017. The six previous seasons – starting with 0-6 in Sabo’s senior season – saw Alton go 2-31-3 in conference play. Sabo wants that sad SWC history buried in the past. With Granite City leaving the conference, and East St. Louis not fielding a team, the league has switched to a home-and-away format instead of playing each SWC foe once. That 10-game schedule gives the Redbirds time to catch the Tigers. But that, Sabo said, will only happen if the Redbirds do not repeat the effort they gave against West. “It looked like we were sleeping out there,” Sabo said. Sarah Foley scored her team-leading fifth goal at 21:54 to give the Maroons a 1-0 halftime lead. Alton was without chances to score for the first 15 minutes of the second half until Alaina Nasello scored off an indirect kick at 55:53 to draw the Redbirds even at 1-1. Alton owned most of the play in the final 20 minutes of regulation and just missed goals on direct kicks from about 30 yards out from Calista Cox. The first, with 16:10 left in the second half, hit the crossbar. Eight minutes later, Cox’s shot missed just high. The Redbirds converted PKs from Cox and Nasello, but Grace Cox’s shot hit the crossbar and Megan Zini’s shot was turned back by West goalie Jessica Brown to give the Maroons a 3-2 edge after four rounds. West’s Courtney Vollmer scored in the fifth round to clinch the win.